This truly remarkable Renaissance ring displays all the characteristics of opulent goldsmith work of the period. As the emblem of Diane de Poitiers, mistress of King Henry II, the stag is in keeping with the spirit of the Fontainebleau court. Seen from the top, six table-cut rubies in box settings create a cross formation that surrounds the raised bezel composed of two addorsed stags cradling a cabochon emerald with their antlers. Entwined is blue strapwork and miniature apples in pale green. The shoulders are ornately enameled in opaque white, translucent green, dark blue, and black enamel. In the center of the D-shaped hoop is a small table-cut emerald. This truly remarkable Renaissance ring displays all the characteristics of opulent goldsmith work of the period. As the emblem of Diane de Poitiers, mistress of King Henry II, the stag is in keeping with the spirit of the Fontainebleau court. For this reason, and based on the sources of the design, the ring is probably French. This truly remarkable Renaissance ring displays all the characteristics of opulent goldsmith work of the period. Its design echoes ornamental prints by French engraver René Boyvin (1525–1598) and goldsmith Pierre Woeiriot (1532–1599). In the latter’s Livre d’anneaux d’orfevrerie of 1561, animal heads protrude from the bezel on a design for a watch ring (Church 2011, fi g. 43), and in a ring in Waddesdon Manor, addorsed fi gures of children support a central stone in a similar pyramidal silhouette (Boardman/Scarisbrick 1978, p. 75). As the emblem of Diane de Poitiers, mistress of King Henry II, the stag is in keeping with the spirit of the Fontainebleau court. For this reason, and based on the sources of the design, the ring is probably French. Paris, Ernest Guilhou (1844–1911); London, Ralph Harari (1893–1969); London, Diana Scarisbrick Collection (1928–). De Ricci 1912, no. 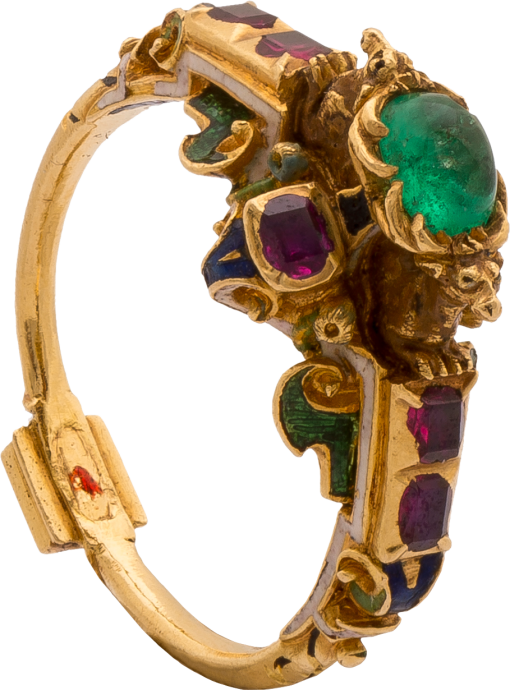 1419 [with an opal]; Sotheby and Co. [Guilhou] 1937, no. 752b, Pl. XXVI; Boardman/Scarisbrick 1978, p. 75, no. 177 and cover ill. [with a crystal]; Scarisbrick 1993, p. 65; Scarisbrick 2007, fi gs. 332-3.